If you’re like most people, energy efficient upgrades make you think of things like increased insulation or a new HVAC system. Most people don’t consider their landscape and how it affects their home’s energy use. 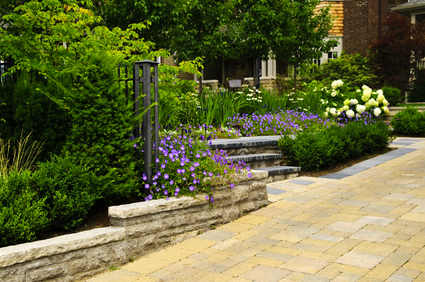 Surprisingly, though, your landscape can have a major impact on your energy bills. We will show you not only how much you can save with an energy-friendly landscape, but how to landscape for peak efficiency. According to the American Society of Landscape Architects, simply planting a few trees to shade your home in the summer can add up to some potentially huge savings. You can expect to see at least a 7-percent drop in your air conditioning costs and possibly more – some people report saving up to 47 percent on summer cooling costs. Trees aren’t the only way to save, however. Because urban areas have so many reflective surfaces – not just roadways, but decks, patios, siding and roofing – they tend to create a “heat island” effect. Adding vegetation to shade or cover these bare areas reduces the outdoor temperature throughout the hottest months, making it easier for everyone in a densely planted neighborhood to save. In the winter, windbreaks are the key to saving money on heating costs. According to the University of Illinois, a well-designed, mature windbreak can save homeowners as much as 30 percent on heating costs. Plant trees over driveways, streets, patios and other reflective areas to break up the heat island effect. Instead of opting for large decks and patios, go with a green, grassy lawn to prevent reflected heat. Use groundcovers instead of mulch, especially in beds against your house, to further prevent reflection. In areas where shade trees simply won’t fit, try trellises and vining plants to shade the sides of your home. Plant thick evergreen hedges or rows of pine trees to block the worst of the winter wind. Avoid planting evergreens too close to your home so that you don’t inadvertently shade your home during the winter. It’s amazing, but it’s true – a few simple changes to your landscape can save you as much as a heating and cooling system upgrade. Whether you decide to give your yard a complete energy efficiency makeover or simply plant a few shade trees, you’ll be saving money and helping the environment.